Attention all knitters, crocheters and yarn lovers! We need your help! If you've been to the Long Island campus in the last three years, you've seen our wonderful crocheted trees designed by artist Carol Hummel and created by her daughters Emily and Molly, and of our amazing volunteers. In honor of our 80th anniversary in 2019, we're excited to announce a new collaboration with the Hummels that's in the planning stages. Do you want to be a part of this community project? Contact Collections Manager Andrea Abrahamsen at aabrahamsen@longislandmuseum.org or (631) 751-0066 x232 to find out how. Happy crocheting! Admission: $10/adults; $5/students 6-17 and college students with I.D. 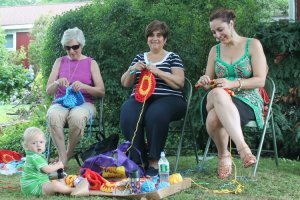 Crochet Workshop is free.